All of these sources should be consulted, as there are differences among them and omissions in all of them. Most marked graves are included. Unmarked graves are incomplete but burials are still being added. 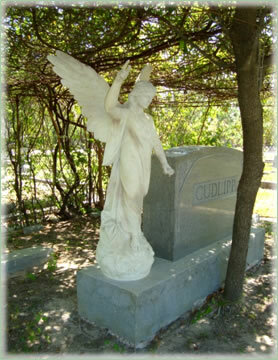 Washington Cemetery burial records are combined with Glenwood Cemetery burial records. Washington Cemetery burials are indicated by "WC-" preceding the section letter. Notes: Cemetery located in Houston, TX. These Rolls Include: Plat Maps, Burials by Plot, Name and Date, Lot Owners, German Society Monthly Meetings (German and English), and Obituaries. At End of Roll 2 a Casualty List of Texas WW II Soldiers by City and Photographs of Houston's. The following three books are available at Clayton Library and in the Texas Room at the Houston Metropolitan Research Center (HMRC). [Houston, 1979] Copy of original records up to 19__. Washington Cemetery, Houston, Harris County, Texas (1806-1956), copied by Mrs. Ross Brinley for Samuel Sorrell Chapter; retyped by Miss Katherine Reynolds. Daughters of the American Revolution. Texas Society. Samuel Sorrell Chapter (Houston, Tex. ), 1975. Headstone inscriptions only. Washington Cemetery Centennial Book: A History of the German Society Cemetery of Houston, Texas: containing plat maps showing location and owner of all cemetery lots and selected biographies of over 850 persons buried therein, compiled by Concerned Citizens for Washington Cemetery Care, Inc. Houston, Tex. : Concerned Citizens for Washington Cemetery Care, Inc., 1988. Out of print. Questions can be sent to BurialRecords@WashingtonCemetery.org. A volunteer will respond as time allows.